Horchata, a refreshing milky drink made from tiger nut, is a must on a hot day in Valencia. Along with paella, it’s one of the most recognizable recipes from the region. But why are people here so obsessed with it? And why is it referred to as the “drink of the gods”? Here are a few facts that you probably didn’t know about this local specialty. You won’t find a healthier drink than horchata. For centuries, it has been known to have all kinds of health benefits, containing vitamin C and E and being rich in the minerals phosphorus, calcium, magnesium, and iron. It stops any nasty stomach upsets, and everyone can drink it, as it’s free from lactose, casein, and gluten and contains almost no sodium. It is very high in calories (100 kcal per 100g) and is unsurprisingly a popular drink after exercise. No wonder they call it the drink of the gods. It’s official. Scientists in Valencia have recently discovered that drinking a little horchata (or anything else with tiger nut in) every day will keep your eyes healthy, too. As if you needed another reason to try it, locals swear that horchata is much more potent than oysters, chocolate, or any other supposed aphrodisiacs out there. And who are we to argue? Try it and see. What exactly is a tiger nut anyway? Really a kind of tuber, tiger nuts were brought to Spain by the Moors, who invaded in the year 711. The tiger nut was originally grown on the banks of the Nile, but the Moors found that the fertile land around Valencia was an even better place to grow tiger nuts. They were used to make chufa milk, which was the base for today’s horchata. Recipes can vary from one horchateria to the next, but the horchata imbibed in Valencia today is made using more or less the same simple process and recipe as recorded back in the 13th century, when it was called llet de xufes. The nuts are dried, soaked, and crushed, and then water is added along with a little cinnamon and lemon rind. Nowadays other flavourings can be added and it may be sweetened with a little sugar, but many people swear the simplest recipe is the best. Going back to the days when tiger nuts were grown along the banks of the Nile, archaeologists have discovered cups inside Egyptian sarcophagi containing the remains of a tiger nut drink. Both the Arabs and Persians were big fans of the tiger nut and its diuretic and energy-giving properties. In horchaterias, you’ll usualy find the drink is served with long, sugary fingers of semi-sweet pastry, called fartons. Like horchata, they can be an acquired taste for foreign palettes, but going out for horchata y fartons is one of the must-try foodie experiences in Valencia. 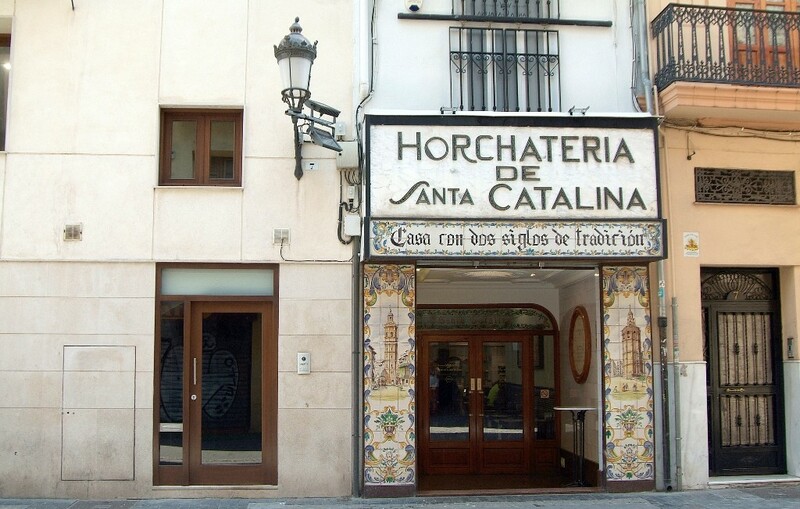 Try it at any one of the many horchaterias in the Ciutat Vella, including the famous Horchateria de Santa Catalina. Or if you have time, head for Alboraya, or Alboraia, a small town that’s part of Valencia and can be reached by metro. Locals say the best horchata is found here. Try your first glass at Horchateria Vida, a pretty café inside a a traditional, simple Valencian country house, as you watch animals roam around the farmland.